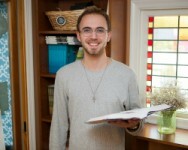 Our newest staff member at Gateway, Josh Dove, has answered some questions for the blog. What is your official position with the youth? How long have you worked with the youth? I have volunteered with the youth for 15 months. I began to feel called to work with youth while serving in campus ministry. I was attending Gateway at the time and decided to search for ways to get involved. Opportunities were abundant; the rest is history. Tell us about a time you were blessed by the students. This one is challenging. Each of the youth has been a blessing in their own unique, and sometimes crazy, way. However, above all, I love their passion and energy. They have a way of celebrating life that constantly pushes me to see the excitement in everything. That has been a huge blessing to me. Tell us about a life you've seen touched. I have been blown away by the youth here at Gateway time and time again. They have true hearts for God, each other, and unbelievers. It is a privilege to see them continue to deepen their faith, and step up to lead their peers. One instance in particular stands out to me. As part of a discipleship program some of the youth and I were having conversations about God with random people at the mall. One of the youth was somewhat overwhelmed. Nevertheless, while talking to the first person that nervousness was superseded by faith and she felt completely empowered to talk to others about God. It was so exciting to see such a quick and dramatic change in her, and it has been even more thrilling to see God continue to nurture her heart for evangelism. Thanks for answering these questions, Josh! We'll be praying that God uses you to touch many lives. All of us are familiar with the concept of "a comfort zone." Some of us might think back to our first date, or perhaps our first job interview as experiences of getting out of our comfort zone that were absolutely necessary for our growth. Although a wise individual might take these lessons and apply them to our growth in Christ, I will be the first to admit that I have not taken too many steps outside my own comfort zones in the area of faith. That is not to say that I have not been willing to share my testimony with a willing audience -- or my willingness to share how Christ has impacted my life -- when people ask... I am willing to do all of that. What I find hard is actually listening with my full heart to what Jesus wants me to do with this life that He saved. I confess that in my busy life here in Northern Virginia, it is too easy to stay in my comfort zone -- even in a life that has been as chaotic as mine has been over the past two years. This week in our men's small group we examined the story of Ananias whom God called to minister to Saul of Tarsus (the man who would become the Apostle Paul) after his life altering encounter with Jesus on the road to Damascus. Saul had been on a mission to capture and punish followers of Christ, and Ananias knew this when our Lord sent him on his mission of healing. There are many surprising elements of this story -- not the least of which is the willingness of Ananias to place his trust in the Lord and heal someone who was a known persecutor of the Church. That said, what I found most surprising about the story was that Ananias was so well attuned to the Lord's voice, that he answered instantly when he heard Jesus call his name. I confess that my ears and my heart are not very well tuned to hear my Lord's voice. Indeed, this is why I really need to take time out of my day to really listen with my ears and my heart to the words that Jesus is trying to share with me. As we celebrate this Easter, we should remember that His gift to us was not only our salvation -- but also the restoration of our relationship with our Heavenly Father. Now would probably be a great time to open our ears -- and our hearts. I suspect that it is also the best way to challenge the limits of our "comfort zone" when it comes to practicing our faith.